Add warmth and style to your contemporary bathroom with the Alison Cork Curved Heated Towel Rail. Curated by interior designer Alison Cork, it is an excellent addition to our Boutique Chic collection. Featuring a popular, modern curved design it will suit any style of bathroom and will fit in any space. Made to the highest quality using durable steel, this heated towel rail is coated in a stunning polished mirror chrome finish. The dual fuel functionality allows it to be powered by both central heating (water) and electricity for better efficiency and control. 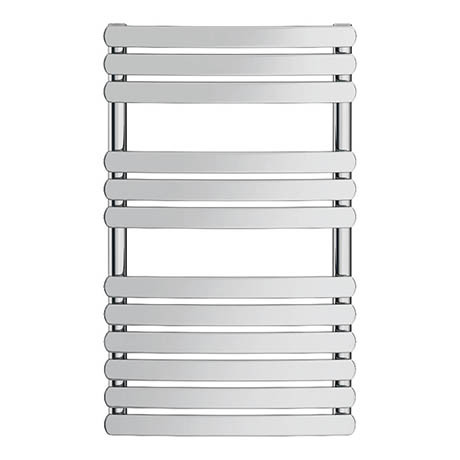 This Alison Cork Curved Heated Towel Rail is also supplied with stylish modern radiator valves. These highly desirable angled valves are designed and manufactured from quality chrome plated brass.